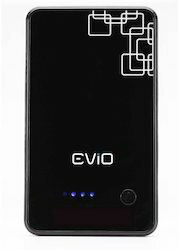 Prominent & Leading Manufacturer from Mumbai, we offer evio power punch 10500 mah power bank, zdo ultra thin portable 10000 mah power bank, 2500 mah power bank, alloy credit card power bank, credit card 5000 mah power bank and portronics 4000mah power bank. 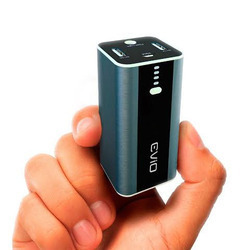 The EViO Power Punch is a revolutionary power bank engineered to offer high powered battery (10,500 mAh) with a design that makes it the smallest and lightest power bank in the world in its category. 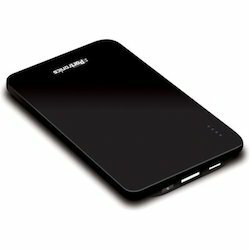 One of the smallest and lightest 10000mAh portable charger. Even the best smartphones in the world run out of battery pretty quickly, and leave you alone when you need them most. 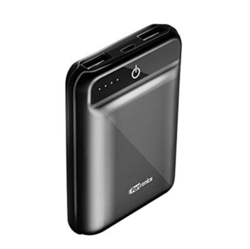 Despite being packed with such power, it has a slim and sleek design which makes it easy to carry anywhere you go. Built-in Lightning & Micro Cable for Both Apple and Android Devices, Universal Fits for iPhone, iPad, iPod, Samsung devices, digital cameras, game consoles and MP3/MP4 players, etc. Multiple protection system inside for safety. BrandSTIK introduces – The newest Alloy Credit Card Power Bank comes with 2500 mAh capacity with built in micro and iPhone Connector. The biggest advantage of this model is its design. 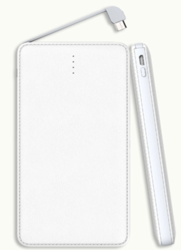 Its one of the slimmest power bank in the market and the alloy material gives it a premium finish. Customized engraving of logo possible on this model. Call now for samples or quotation. 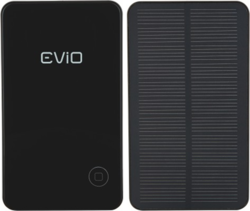 Introducing the latest EVIO Solar Charger 3000 mAH Power Bank.This EViO range of eco-friendly solar mobile chargers which can charge all your mobiles on the go. These are in fact dual powered so when it's not possible to charge through the natural light you can always fall back on the option to charge through USB cord. Introducing the latest EViO DUOPOWER SOLAR POWER BANK (6000 Mah).These EViO range of eco friendly solar mobile chargers which can charge all your mobiles on the go. These are in fact dual powered so when its not possible to charge through natural light you can always fall back on the option to charge through USB cord. 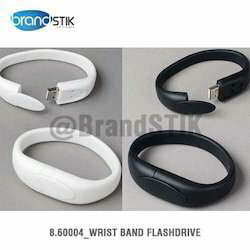 Twister Pen Drive is one of the most popular and cheapest Pen Drive manufactured by BrandSTIK.The main reasons for this are; no cap to lose and that we can pantone match the body of the memory stick to match the logo colour. This memory sticks also allow you to rotate the metal clip around 360-degree. The metal clip can be engraved or printed on both sides. Removable strap with built-in, 8GB detachable memory stick. 22 ( l ) x 15 ( w ) x 1.9 ( h ). 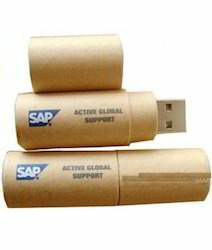 Slap on Flash Drives are great wearable USB sticks which have a silicon material. Just slap across your arm & it folds up comfortably thanks to a steel brand inside. Suitable for all wrist sizes. 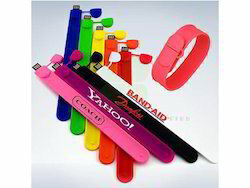 Available in pantone matched colors in in 2 GB, 4 GB, 8 GB, 16 GB and 32 GB capacity. 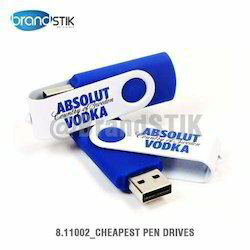 BrandSTIK offers you fully customized Credit Card Pen Drive @ lowest price. It can be easily placed in your pocket or wallet and carried around. 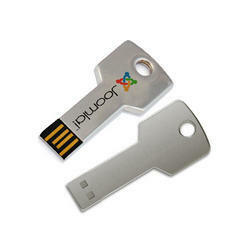 These Credit Card Pen Drive also offers the best branding space with 4C digital print on both sides of the card. It's extremely easy to use and portable. Limited stock of 8 and 16 GB at special price. 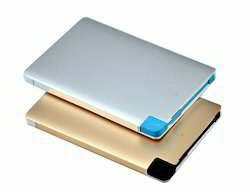 •5000 mAh Sleek Design Power Bank. •Light Up Logo. •Input : DC 5V/1A | Output : DC 5V/1A. •LED Indicators. •LED Branding Area to be Engraved. •Packaging : White Cardboard Box. •Size : 11.5 x 6.9 x 1.1 cms. •Colour : Black, Silver. 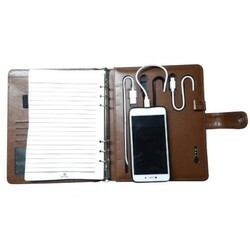 BrandSTIK presents a Leather Diary with built in 5000 mAh Power Bank with Micro + Lightning cable. This gift provides year long branding and high utility. •Compatible with Android and iOS Smartphones. •Also has a type-C Connector. •Single press button to switch off/on the power bank. Highly Compact and Lightweight with dimensions similar to your phone . Fits easily in your palm making it easy to carry around while it's charging the phone. Dual input charging : one with 1A Lightning port and other with fast charging 2A USB port. Strong and durable Kraft packaging ensures great safety while storing the device. 6 level protection including short circuit, current and voltage overload, over heating and protection against wrong insertion. 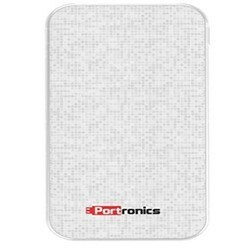 Light weight and power packed the PORTRONICS Power Bank come with 10500 mAh battery, it has four LED indicators which will represent the power status of the battery while being used as well as being charged. There is one On/Off button to allow and disallow the power bank to transfer the charge. Includes two output sockets which mean you can charge two devices at a time. Size 2GB, 4GB, 8GB and 16GB and 32 GB. 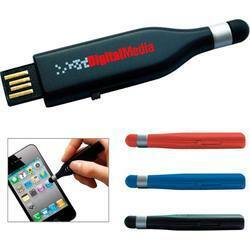 Since our foundation, we are known in the industry for offering a huge variety of Key Pen Drive. We believe in customer satisfaction so we use high grade processing techniques and equipments for our entire processing. We offer superior quality in our offered product range at industry leading prices. 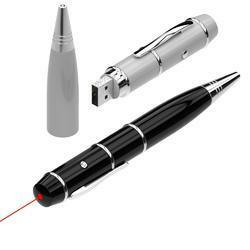 Our Key Pen Drive is widely appreciated among our clients due to their salient attributes. Our product is known for its unique designing and distinct features such as long term sustaining and high in quality. We work to please our valuable customers with our excellent quality product range. Our Leather USB Pen Drive is perfect in dimension and flawlessly finished. Our offered range of products including Leather USB Pen Drive is obtained after the use of superior quality raw material processed in high advanced machinery and equipments. We have given extra fine finishing to our final product range to attain maximum satisfaction of our clients. Moreover, our clients can avail this product from us at industrial leading rates and customized packaging. 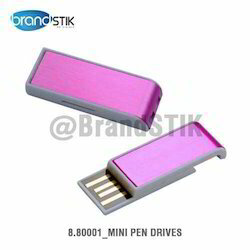 BrandSTIK is manufacturer of Mini USB Pen Drives. 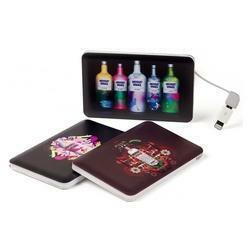 it's ideal products for promotional items , business gifts, corporate gifts. The sleek and compact design allows you to carry this mini USB storage device without any discomfort. 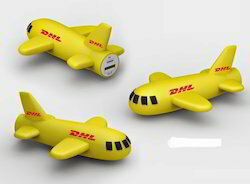 We can supply Mini USB Pen Drives in a wide variety of sizes -2GB, 4GB, 8GB and 16GB and 32 GB. It can be customised with your logo printing. Customized power bank with your logo printing or shaper. Looking for Power Banks & Pen Drives ?